Here we are at the sixth and final blog post in the series Profile of a Unique Learner. Are you ready to meet The Daydreamer? Amanda experiences a little something referred to as attention focus disruption. Attention focus disruption can look a lot like, and is often confused with, Attention Deficit Disorder, or defiance, or even laziness. It is none of those things. Amanda often lives in her own little world. Her mom affectionately calls her a daydreamer. Her concerned dad (not so affectionately) calls her a daydreamer. Her teachers report that Amanda’s daydreaming interferes with classwork. Amanda rarely appears to listen to instructions. Either her eyes wander, or she doodles on anything and everything in front of her. Her paper. Her desk. Her hands. This does not exactly endear her toward the people requesting her attention. Amanda’s attention always moves to the most interesting thing in the room. If her teacher doesn’t happen to be it, Amanda disengages. While Amanda is quite social and has plenty of friends, she isn’t particularly chatty. She also isn’t a big fan of reading. You can attribute these traits to low verbal processing skills, but you certainly can’t dismiss her as unintelligent. On the contrary, Amanda is incredibly bright. Actually, if blank, unresponsive stares are involved, I hope one of your first instincts is to rule out a possible seizure disorder or form of Tourette’s syndrome. But that’s a whole different story. If you find yourself with a daydreamer like Amanda who may often appear under-stimulated or bored, congratulations! You are likely in the presence of a gifted child. Just like The Storyteller and The Flip Flopper, Amanda is a visual thinker. She thinks in pictures, not words. This not only makes her highly curious, it makes her think faster than her verbal thinking peers. Unfortunately for Amanda, this means she reaches boredom quickly. As she waits for everyone else to catch up, she searches for ways to keep her mind challenged and engaged. Yes, she looks like she’s daydreaming. But while she’s daydreaming, she is engaging (and strengthening) her gifted imagination. Please, whenever possible, do not discourage her! This type of daydreaming is actually a good thing. Many students like Amanda have the enviable talent of keeping multiple channels of thinking open all at once. In other words, don’t get in a huff when you suspect she’s not paying attention. She’s probably daydreaming AND listening to you at the same time. 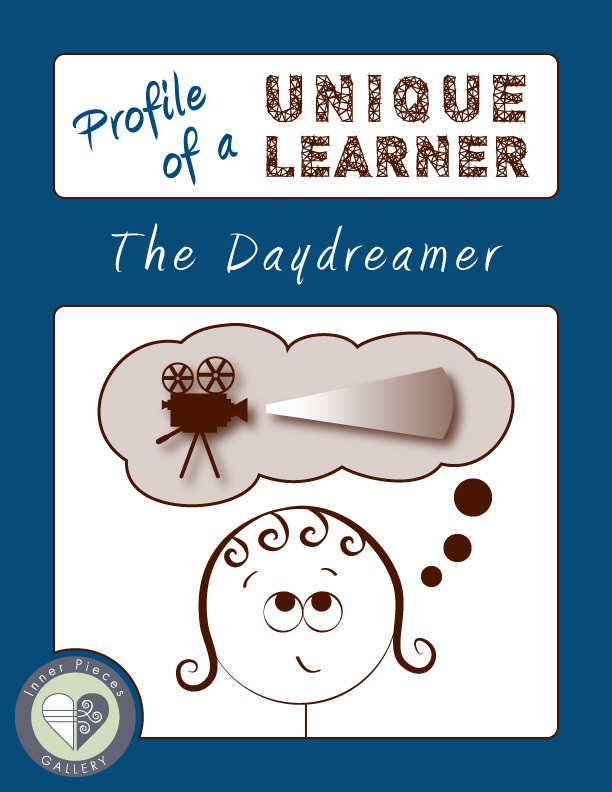 For students who fit The Daydreamer profile, these are just a few suggestions. While we certainly want to nurture the gifts of any budding creative genius, we don’t want our bright young thinkers to be distracted by every shiny object. A good place to start attention focus training is to have students keep eyes on a target for a goal of 3 minutes, all while walking toward and away from the target. Once they reach their 3 minute goal (which may take weeks or months to achieve, by the way) we increase the level of difficulty and set a new 3 minute goal. This may seem counterintuitive for someone who already thinks in pictures. However, the key in this case is to use a student’s visual strengths to bolster weak verbal processing. Relating heard information to visual imagery builds understanding and recall. At the basic level simply say any word (avoid non-visual words) and ask your student to describe it to you in detail. Practice with single words, then build up to phrases, then sentences. When ready, apply these same principles to written words using vocabulary cards and simple reading material. Progress to more advanced passages until visualizing written material becomes second nature. Some struggling readers like The Daydreamer (and The Storyteller) find themselves reading random words from different lines on the page. Suddenly they read a word from 2 lines above or 3 lines below the line they are reading. Building Visual Tracking Skills THE BOOK targets this issue plus helps students build visual discrimination skills at the same time.